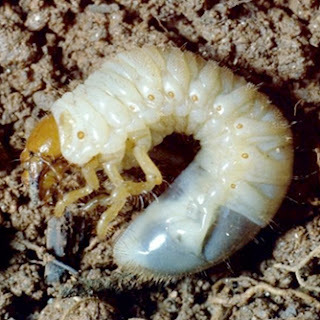 Curl Grub larvae have a cream body with a light brown head and they vary in size from 4mm to 40mm when fully grown. 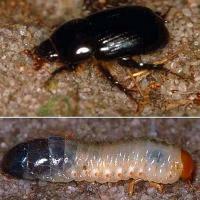 They are the larvae of several different species of beetle including the African Black Beetle, the blackheaded pasture cockchafer, Christmas beetles and Scarab beetles. They feed on dead plant material and the live roots or stems of a broad range of plants including lawns and can cause severe damage to lawns, gardens and potted plants. It is their habit of curling up into a 'C' shape when disturbed that gives them their common name of curl grub. They are often incorrectly referred to as 'witchetty grubs'. The beetles lay their eggs in areas of soft soil over a three month period at which time you are likely to find both adult beetles and larvae in the soil. It is during warmer weather that new eggs hatch and older larvae move closer to the soil surface feeding more heavily on plant roots. The hotter weather adds to the burden of plants trying to survive with a diminishing root ball. As such Spring and Summer are generally the best times to treat lawns and garden beds. If you notice any in your vegetable garden you will need to turn the soil over and pick them out by hand (we have fun feeding the Butcher birds who are quite clever catching them mid-flight when we throw the grubs into the air). Infestation levels are usually worse after a prolonged period of very dry and hot weather. As the curl grubs feed, plants and lawns fail to perform well and often appear to be need watering, despite the soil being moist. In really heavy infestations brown patches will appear tin the lawn and the grass will pull away very easily. There is really no safe application for control in the vegetable garden, however you can treat lawns with Confidor Hose-on. Optimum application time is from mid-spring to mid-summer when the eggs are hatching and larvae are near the surface of the soil. Eco-neem can also be used on lawns, garden beds and potted plants as a soil drench using a watering can.